The Be Present campaign involves the TAC turning Victorians into presents to spread the message to take care on the roads this Christmas. Members of the community will be able to make their own personalised Christmas card with their promise to their family and friends to be present this Christmas. To make a free video eCard to share with your family and friends to encourage them to #bepresent this holiday season, visit www.bepresent.net.au. A giant inflatable present will make its way across the state to high-risk road trauma locations including Gippsland, Bendigo and Warrnambool. 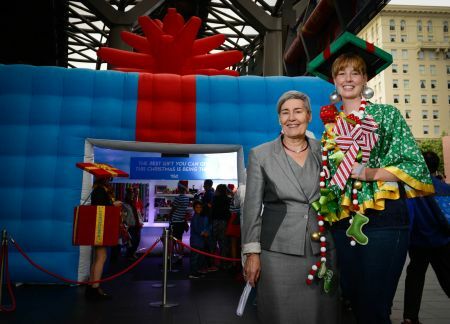 TAC Chief Executive Officer Janet Dore said the most important gift anyone could give at Christmas was being there to celebrate all the special festive moments with their loved ones. "The best gift you can give is simply being there, which is why we're urging all Victorians to be present this Christmas," Ms Dore said. TAC CEO Janet Dore and TAC client at the be present launch.